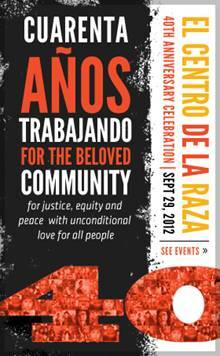 El Centro de la Raza is 40 years old this year. To celebrate, the local non-profit organization has planned a 40th Anniversary Celebration on Saturday, September 29 at the Seattle Westin Hotel, including a reception, historical art walk, live and silent auctions, awards, and more. The keynote speaker will be New Mexico Congressman Ben Ray Luján, the second Vice Chair of the Congressional Hispanic Caucus and the Co-chair of the bipartisan Technology Transfer Caucus. Seating is limited. To register, donate, or find out more about this upcoming event, see the website here.